Do you still remember the first castle or palace you ever visit? Which one was it and what was the impression you took away from it? The first castle I visited was the one on my hometown, Serpa. The castle dates back to the Muslim occupation of the Iberian Peninsula, around the VIII century. So it's quite old. This castle has always been for me a walk mandatory point. Since childhood I love walking along its walls and admire the view. Since that time this building gives me a very great sense of peace, perhaps because on its walls we can see life happening around without anyone realizing it. The first palace that I visited was the Ducal Palace of Vila Viçosa, official residence of the Dukes of Bragança, whose construction began in 1501. With the rise of the House of Braganza to the throne of Portugal in 1640, Vila Viçosa Palace became the permanent residence of the first family of the national nobility, the most important of the royal residences scattered around the kingdom. At that time, the feeling that overwhelmed me was national pride. The palace is not the greatest monument of our country, but because it is one of the symbols of the last reigning Portuguese dynasty, gives us a huge national symbolism. I'll be visiting Lisbon and Porto this June. Apart from Sintra - which I'll make a priority to visit - Portugal is a bit of a blank page for me though. Which one are the castles every Castleholic should see? Thanks to the Muslim occupation, if there's one thing we do not lack in Portugal, it is castles. But they may be very different constructions to the ones existing elsewhere in Europe. They are very simple. With that medieval vibe, but very large and imposing. Sintra is undoubtedly a mandatory destination and I assure you that the atmosphere of the village will be unforgettable. 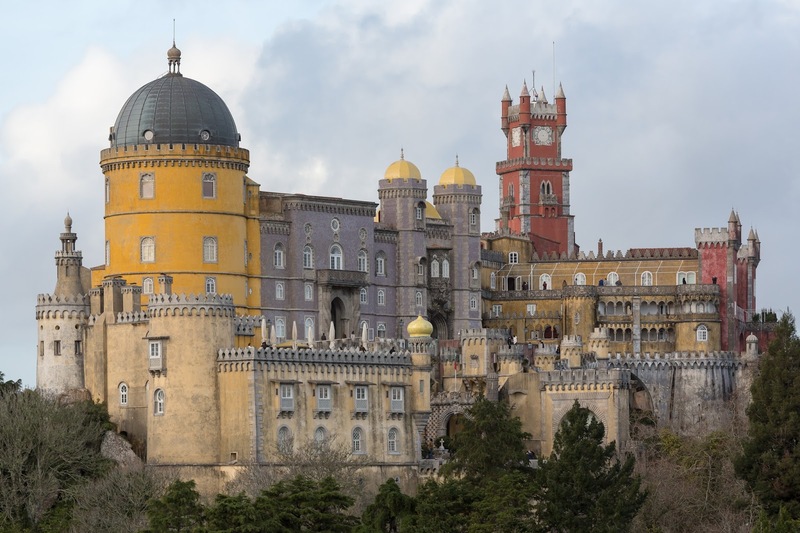 And there’s a lot to see there: Palácio da Pena, Muslim Castle, Sintra Palace, Setais Palace, and Quinta da Regalaeira (not a royal place but a MUST SEE). Any small land, especially in the interior, has a castle or fortification. The Castle of São Jorge in Lisbon, should be a mandatory point too. Personally I think the Almourol Castle, Santarem, for its location and history (closely linked to the Templars) should also not be forgotten. Obidos, Monsaraz, Marvão and Santa Maria da Feira can also leave you with very special memories. Focusing a little more on Lisbon and Porto, can you recommend me a few royal places to see there? In Lisbon, apart of Sintra you also have to visit Cascais (and Estoril), exile home of several royal families in the 50's and 60’s. You may not have proper Royal Palaces, but you will see houses that are pretty close of that. Even today many nobles still live there (Felipe and Letizia of Spain visit Cascais with some frequency). Near Lisbon, in the town of Mafra, you have Mafra’s National Palace. The monument gathers a palace, a church and a monastery in the same building. This deserves really a visit, because it is great. The building was a promise of King João V, if his wife Maria Ana had any children. When the couple’s first daughter was born, the works began in 1717, and its history is immortalized in the book "The Memorial do Convento" by José Saramago (Nobel laureate in 1998). Also near Lisbon you have the Palace of Queluz, built in 1747, intended to be a summer residence. Despite being much smaller, it is often called the "Portuguese Versailles". In Lisbon you have the Palace of Ajuda (where the State Dinners are served when we have any) and the Praça do Comércio. In Porto, unfortunately I can’t help you very much. Porto has never been one of the preferred destinations for the Portuguese royal family. Only during the French occupation, Porto was a prominent place. But it has gorgeous monuments, specially churches, and lovely buildings. You will find it quite different to Lisbon. But I invite you to visit Guimarães, birthplace of the Portuguese nation (has a great castle) and the Castle of Santa Maria da Feira, also near Porto. Baroque, Renaissance, Medieval or another era: Is there a time period that you especially enjoy when it comes to castles? Or what does it need to have to end up on your list of favourites? Hard question. I think every building is the result of its time, its history and also of its purpose. I like the practical side of the medieval architecture, the Baroque drama, and the Renaissance light. Interestingly, I think that the simplicity and at the same time the grandeur of the medieval buildings fascinate me most. Later all those palaces with many rooms with silk paneled walls, always made me wonder if the people who walked daily through those corridors valued what surrounded them. And all the associated wealth. But honestly what fascinates me most about a monument, careless of its style, is all that it conveys to the touch. What the walls whisper to you. I love to hear the sounds of my footsteps echoing those halls. I like to walk and think who walked by, what stories in history were fomented inside those walls, the lives that were lost in its construction and the true symbolism that the construction has brought to the nation and for the people. You enjoy both royal jewellery and fashion: Imagine you could sneak away a gown, a tiara, earrings, a necklace and bracelet - which ones would you choose and at what palace would you dance the night away? Well, I'm not at all an expert in jewelry... A dress previously worn by some royal lady? Well I am a fan of Crown Princess Mary's style. I think any velvet gown worn by her on New Year's Reception is simply fantastic. Regarding tiaras, I'm very traditional. I love Fringe tiaras. Any fringe tiara. I would choose the Kokoshnik Fringe Tiara worn by Tsarina Alexandra, or, for a simpler version, the Baden Fringe tiara. For earrings?? Humm ... I love Queen Silvia's Diamond flower earrings. Or a simple pendant tear shape diamond earrings. I confess that I love the Swedish Cameo set, especially the bracelet. But I do not think is very well the tiara and earrings I chose, so once again I’m going to the Swedish royal vault and pick the bracelet Princess Madeleine wore on her wedding day. I find it modern but yet very royal! A Palace to dance? Palace of Pena, in Sintra, of course!!!!!!!!!! !